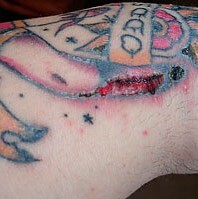 When it comes to getting tattooed, I myself have never had any sort of infection or problems after the deed is done. This is most likely because I go to reputable and professional tattooists whenever I want work done, but sometimes no matter how good your tattooist is, infections can occur. This doesn’t necessarily have anything at all to do with the artist. If you don’t follow the artist’s after care instructions with regard to your tattoo, then you can very easily be heading for an infection or other problems with the skin. I once had a tattooist tell me to never, ever expose my tattoos to the sun. Okay, it makes sense that sun will fade your tattoo, but come on! Never expose my arm to sunlight? Not going to happen. I guess there can be a mixture of information about tattoo after care and it’s possible that some people might be a little confused or perhaps apprehensive about their newly acquired tattoos. So who do you ask? Who knows the most about it all? Well, it’s safe to say that if you’ve gone to a decent and reputable tattoo artist, that you can listen to what they say and follow their directions and things should be just fine. Sometimes though, tattooist do disagree about after care policies, so the uncertainty can still continue even amongst artists. I would say however, that if you really want to know the skinny on this sort of thing that it’s best to find out from a doctor. After all, doctors know a lot of stuff and it’s safe to say that when it comes to skin and infections, doctors know more than any tattoo artist. No offence, artists. That being said, if you’ve just had your first tattoo done or your first piercing and you’re a little bit uncertain about what’s going on with your newly acquired body art, it might be a good idea to check this bit of information out from the Medscape website. Then again, if you didn’t listen to your tattooist when he or she told you what you can and can’t do with your skin after getting pierced or tattooed, chances are you aren’t going to listen to what a doctor says either. None the less, this stuff is important to know, so whether you’re going to get some body art done or you’ve already had some done and the surface area is now turning a frothy white colour, you might just want to check this information out.